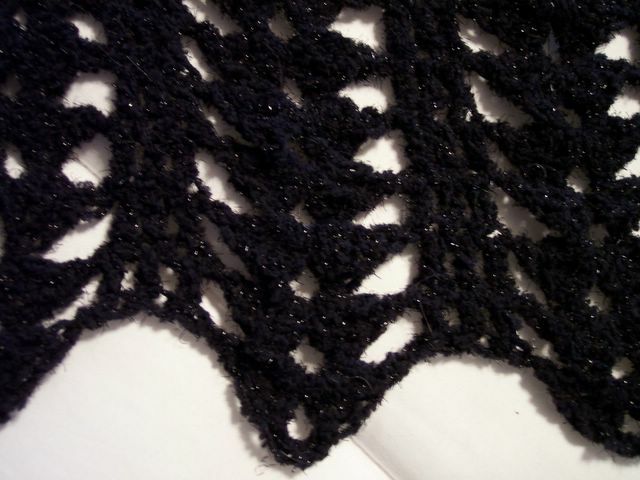 Lisa Lately: Yet Another Serafina Shawl! I've finished all the pieces to my sweater, but I've had to put off assembling it. Brigid is going to the Winter Formal this weekend with her boyfriend. She'll be wearing the same dress she wore to the Theater Awards last spring, but since the dress has spaghetti straps and this is January, she needed a warmer wrap than the light shawl she wore with it in May. Brigid asked me to make her a Serafina Shawl (pattern here), so off I went to Hobby Lobby to find an appropriately dressy yarn to use. I picked up several skeins of Moda Dea Cheerio in black. This is a soft, slightly furry yarn, sort of like a cross between TLC Amoré and a thin chenille yarn, but it also has some sparkly bits in it, which makes it perfect for a shawl for a formal dance. I used an N hook and about 3½ skeins (1.76oz/50g) to make a shawl that comes to Brigid's elbows. I'd never used this yarn before. Overall, it was fairly easy to work with, helped by the large N hook of course. But the yarn did shed some of the sparkly bits as I crocheted. 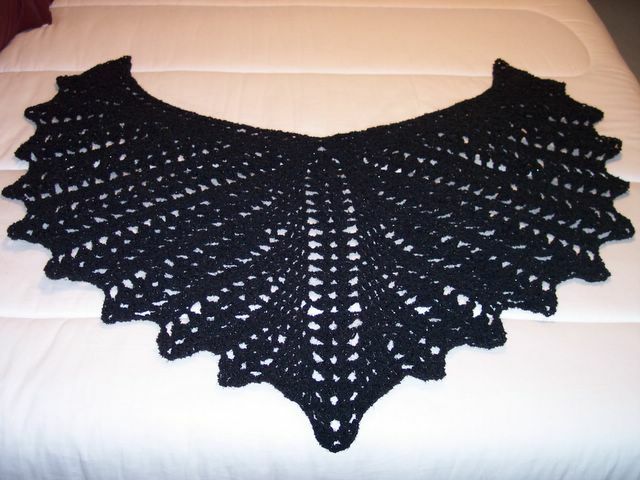 Here are a couple of photos of the finished shawl. You can click on the photos for a larger view. I hope to have pictures of Brigid actually wearing it this weekend, but we'll have to wait and see if she'll let me post those here or not! This close-up shows some of the sparkly bits. And if you look really closely, you can see where our cat Rika contributed some of her own sparkle to the effort. No matter how careful you are, if you live with cats, you live with cat hair!